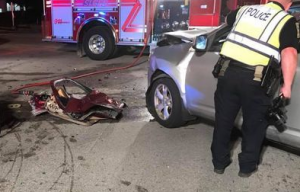 Gracimise Exavier, of Port St. Lucie, is Dead, Five Others Injured in Port St. Lucie Crash | Schuler, Halvorson, Weisser, Zoeller & Overbeck P.A. Gracimise Exavier, died and five people were injured in a crash in Port St. Lucie police said. The wreck took place at Southwest St. Lucie West and Southwest California Boulevards near Walmart Supercenter and Starbucks. First emergency responders arrived at the site of the crash soon after the accident happened and the victims were transported to Hospital for treatment. Ms. Exavier was pronounced dead at the scene after the two-vehicle crash. A female victim was taken to St. Mary’s Medical Center in West Palm Beach. The other two victims were taken to Lawnwood Regional Medical Center in Fort Pierce. The man and woman from the other car were taken to Tradition Medical Center in Port St. Lucie. A video from the scene shows it is currently swarmed with police cars and fire trucks, and the intersection blocked. Avoid this intersection if possible because it is currently closed. According to the police, the fatal crash at SW St. Lucie West Blvd and SW California Blvd is still being investigated. This route is partially blocked `due to the severity of the crash, causing traffic delays. Vehicles are seen pulling into nearby Starbucks and Walmart parking lots. It is best to use alternative routes such as SW Heatherwood Blvd and SW Cashmere Blvd. Port St. Lucie attorney Jason Weisser of Schuler, Halvorson, Weisser, Zoeller and Overbeck responded to this unfortunate accident with a death of one woman: “This is a tragic accident here in St. Lucie County. We hope for the families sake that it can be quickly discovered what the cause was. Please be careful whenever you are driving a motorcycle, car, SUV or truck. This is especially true when you are transporting children in your vehicle. If you have been injured in an accident, call my office for a free consultation to find out what are your rights”. The post Gracimise Exavier, of Port St. Lucie, is Dead, Five Others Injured in Port St. Lucie Crash appeared first on Traffic Center.